If you look closely you'll notice that it simply expanded the OR condition by repeating all conditions i.e. it changed a AND (b OR c) to (a AND b) OR (a AND c). The resulting query was 50% smaller in terms of cost and 33% smaller in terms of execution time. I simply do not understand why re-arranging the OR condition changed the plan when both queries are identical (?). I could have expanded the OR condition myself by copy-pasting the conditions but why should I? 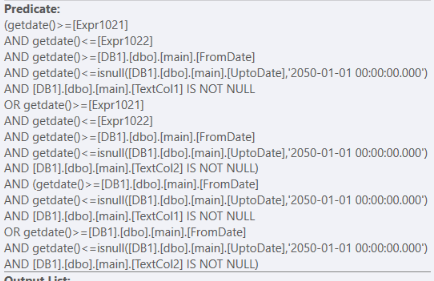 But why doesn't SQL server sees both queries as one? After all, a AND (b OR c) = (a AND b) OR (a AND c)? Logically it is the same, and it will get the same results. My assumptions are that for the 'faster' plan, the optimizer is not considering some filter statements at the top of the OR to be the same as some filter statements at the bottom. I might be entirely off base here. This filter predicate uses the result of the join between the Main table and manymany table. Notice that EXPR1021 and EXPR1022 in this filter are expressions created from the scalar operator on the manymany table. And the second part needs to be true no matter what, as they are AND predicates without any OR's. Resulting in extra calculations of the same functions, that in my opinion are not needed. Again, my guess here is that the reason that sql server does these calculations is that it does not know that they are the same. In the 'slow' plan, the statements are not added together with OR clauses, and that is why the optimizer is generating a different plan, applying filter predicates on the tables separately (and no duplicate filters). I think that you got lucky with the performance of the 'fast' plan, but that the 'fast' plan might turn ugly when the matching data increases. It can depend on where and when you are applying your filters (and other factors). In the 'fast' plan: sql server applies some of the filters after the join of the main table with the manymany table as a result of different combinations with the two OR's + (AND ... AND ... AND...) blocks. The columns from the maintable are filtered after finding all the possible combinations with the manymany table. For the predicates above and below the OR. Resulting in extra calculations that in my opinion are not needed. 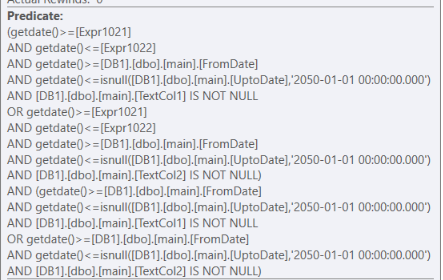 In the 'slow' plan: sql server applies the filter directly to the Main table as a result of the AND (TextCol1 IS NOT NULL OR TextCol2 IS NOT NULL) part and then joins with the manymany table to filter out the rest to get to 15 rows. Which is actually about 20x less than what was expected, which is 1947 rows. is evaluated on these 1947 rows. Then the filter operator (main.TextCol1 IS NOT NULL OR main.TextCol2 IS NOT NULL) to reduce it to 1374 rows. After this, join these 1374 rows to the dbo.manymany table to get 15 rows returned. It is filtering with a seek predicate, returning 27 rows to the nested loops Join operator, again joining with the dbo.manymany table. And is applying this filter to 1943 rows. While the other OR, on the 'faster' plan, is being filtered after the join from dbo.Main to dbo.manymany, and results in a much bigger filter, on the 27 rows. Much bigger filter with multiple OR's on 27 rows. 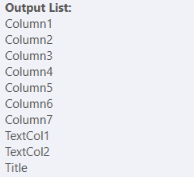 which gets 10 additional columns from the clustered index, but only has to do this for 27 rows. Another reason that the optimizer chooses the 'slower' plan might be because the optimizer thinks not looking up the other columns would be better. Is the fast plan even faster, or always going to be 'faster'? I do think that, if the data passing through the filter increases, the 'slow' plan will be better. Not only due to the key lookup, but also due to the bigger filter operator further down in the plan. If that happens, next to indexing. You could improve the filtering by splitting the query into multiple parts using a UNION statement. In the first query, It has to start with a scan whereas with the second it was able to utilize the non-clustered index for a seek. Think about it like you have 100 marbles in a bag and you want to audit them to pick out only the ones that are blue and white or blue and red. The first query is saying, look through each of the 100 marbles and pick out all the blue. Once you've done that, check all them and see if there are any with white or red. The second query is saying go into the bag and only grab blue and white or blue and red marbles. The second query would be faster because you wouldn't have to look at each marble for just the blue first. You could combine that step with what you really wanted which was blue and white or blue and red. That's how I look at it anyways. 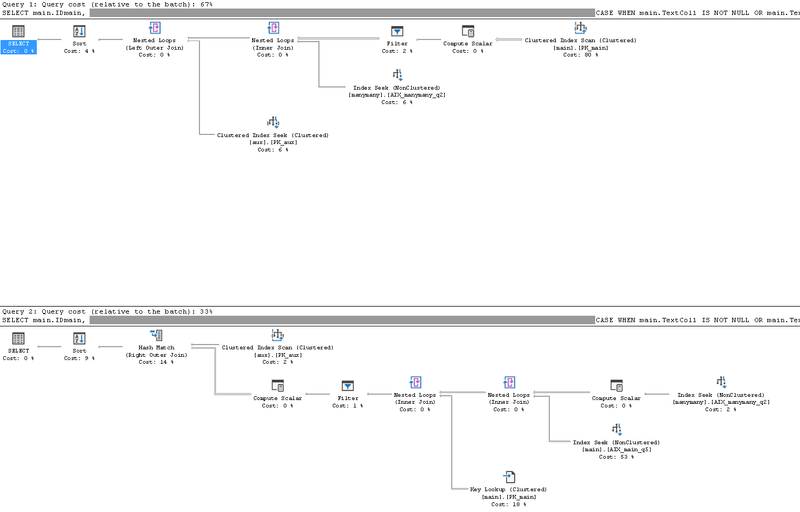 Ultimately the first query required a table scan and the second used the seek right from the beginning. It still had to do a key lookup and a scan because the non-clustered index didn't have all the information it needed, but by that point it had a much smaller set of data to look through so it was faster. Not the answer you're looking for? Browse other questions tagged sql-server sql-server-2012 optimization execution-plan or ask your own question. Is it correct, order of where clause doesn't matter when it is used with join? Sql Server Plan - what is a Filter after an Index operation?